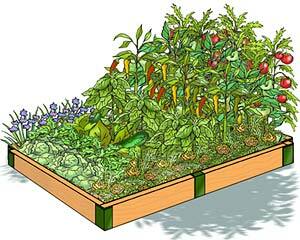 Raised beds avoid the issue of gardening in poor soil. The soil in raised beds doesn’t get compacted because they are constructed with accessibility in mind. No one will be walking in your raised bed vegetable garden, which means the soil will stay fluffy, non-compacted and healthy through many growing seasons. You can plant more in a raised bed garden because you don’t need to leave room for paths. You don’t walk in them, you simply lean over to work in the garden. Raised beds require less maintenance than conventional gardens. You will have fewer weeds because raised beds tend to have more plants in less space than a traditional vegetable garden which means less room for weeds. Raised beds drain better because they are elevated. Therefore you can work in them in the spring when your yard is still muddy. This also means they can dry out faster, but raised beds are easy to water and the smaller area is perfect for installing drip irrigation. Raised beds are easier on the back. Every inch the bed is raised is one less inch you will need to bend. Raised beds are attractive! 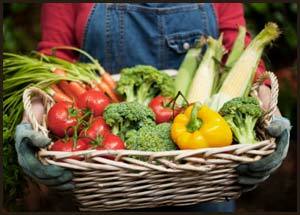 It’s easier to see your produce, pests and weeds, making it easier for you to take good care of your plants.